Web design and development for beloved Austin theatre company. Since 1932, the iconic ZACH Theatre has showcased Austin’s vibrant culture and love of the arts, hosting over 100,000 patrons annually. Known for its eclectic and often boundary-pushing selection of performances, those who visit the ZACH have come to adore its indisputable personality and one-of-a-kind “no apologies” persona. Looking to revitalize its dated digital presence, ZACH tasked our team of creatives with designing a custom and fully-responsive website. In order to align the website with the caliber of the beloved ZACH brand, we first examined the current internal structure and content organization. Built in the early 2000s, the ZACH website contained over 200 pages of content, along with two navigation systems. The crux of the site, the ticket buying process, became increasingly difficult to use with advancing smartphone technology. With a goal of designing an aesthetically pleasing site with fluid and engaging user experience, we knew that a complete redesign was necessary to bring this “technological dinosaur” into the modern age. To successfully portray the theatre’s personality, we drew inspiration from the vibrant color palette of the ZACH logo, while incorporating professional photography from its digital library of performances. With the right design in mind, our team set out to reinvent the site, creating a logical and streamlined forum of information for both ticketing and current programming. Our next challenge was integrating the existing ticketing system and customer database with our custom design. 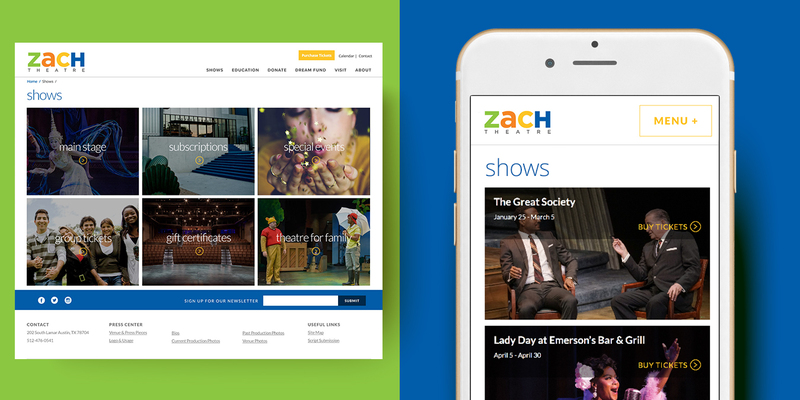 In the end, we built dozens of custom WordPress templates, accounting for all of the upcoming performances and events, the theater’s family programming, outreach opportunities, and performing art classes, in a digestible and user-friendly format. 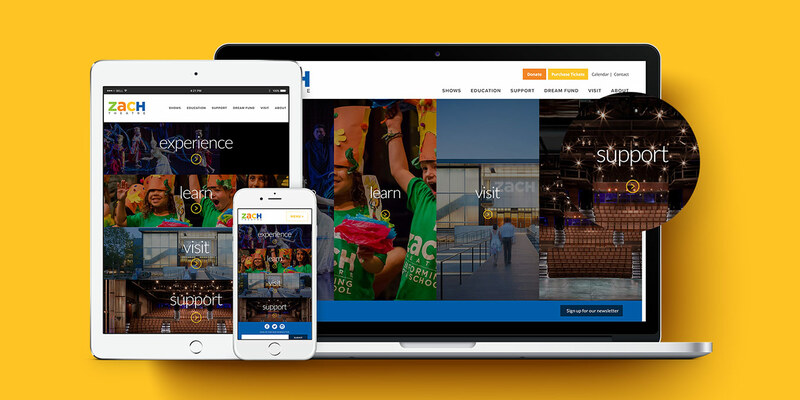 "Our team was tasked with creating a custom site that not only captured the venue’s dynamic spirit, but also improved user experience." 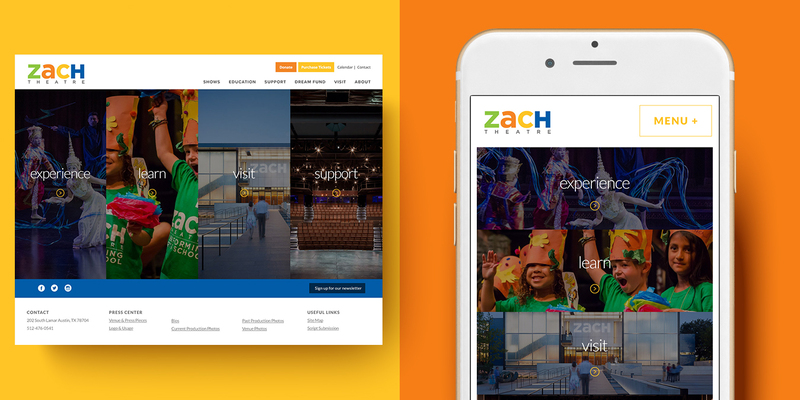 Our award-winning site standardized ZACH’s visual identity, bolstered brand awareness, and further elevated the site’s user experience, driving more sales and class enrollment.